Yes, Ive been away... Apologies for this delay. DRIFTWOOD 'moon T8' - 23.976p/29.97p/ 59.94p After interpreting some of the GH4 stuff in mp4 files AVCHD, and fine tuning the matrices, lowering the GOP Related stuff (to achieve more power in non death chart situations and subsequent higher bitrates) this setting should achieve better IQ with a stronger matrix to knock out any artefacting that people may be suffering with moon T7 on HBR/50p/60p modes. Subsequently, you get a finer low frequency matrix that strives to knock out artefacting at the expense of QP and higher bitrates. Ive settled on a QP rate control centre point of Q14 and the matrix adapted from the GH4 and improved has been tweaked to the max. However, its untested outside of me and needs your input. Peak bitrates for all modes means only the best SD cards should be used. I doubt this will work in iA modes and iDynamic. This is a TEST and report back setting! Just Released: 5th Aug 2014 - Driftwood Spizz T7 - The Comfortable Setting! Very good IQ. Check it. EXPERIMENTAL SERIES 1 - Apocalypse Now Series & Boom! Also the place to find Cluster v7 settings with cbrandin 444 matrix and sharp variation. 11-01-2013 NEW Cluster v8 'DREWnet' 'cbrandin Cinema Smooth' setting 12/15 GOP released. See below. 12-01-2013 NEW Cluster v9 'DREWnet' 'Boom 4444 matrix' setting 12/15 GOP released. See below. PLUS New Cluster X in trial amongst the thread. Nebula versions (6 GOP) of all three Cluster 12/15 settings will appear here soon. I have a GH2 with MD rokkor vintage lenses, im gonna shoot mainly music videos (with a lot of moving shots, slow motion, low lights and exterior) and some short films in the future. 30min of clips is enought for me I need quality but i really like the vintage look, im lost there is too much patch and informations, so i call your experience, what is the best possibility for me ? Reliable 100Mbps peak performance in AVCHD 24H, HBR, FSH, SH, and MJPEG HD. Exclusive 140Mbps turbo mode boosts peak bitrate to handle 80% Slow-Motion 24H mode. Records reliably with Class 10 30MB/s cards, with 60Mbps file-spanning in 24L, FH, and H modes. 95MB/sec SD cards support file-spanning in all video modes (except NTSC HBR 30p and FSH 60i). Full support for all NTSC and PAL video modes and options, including ETC zoom mode. Failsafe operation with any lens, in any video mode, under any type of shooting conditions. Consumer-friendly auto-exposure features fully supported in 60Mbps 24L, FH, and H modes. Fast Action 3-Frame GOP performance with B-frames visibly indistinguishable from I-frames. Optimal motion picture quality consistently maintained in underexposed low-light conditions. Flow Motion v2 is the culmination of over three months of investigation into the core encoding parameters of the Panasonic GH2 AVCHD encoder. The goal of this project has been to produce a unified patch that combines failsafe reliability with consistent, high quality performance across the entire range of video modes and options provided by the GH2. These criteria include not only still-frame image quality, but frame-to-frame motion picture continuity as well, evaluated perceptually at 24, 25, 30, 50, and 60 frames per second. Rather than simply maximizing the encoder's peak bitrate, Flow Motion v2 is fine-tuned to produce optimal motion picture quality with minimal degradation from undesirable aliasing and digitizing artifacts. The result is an unmistakable improvement in video quality with no significant drawbacks, using Class 10 30MB/sec SD cards and virtually any lens compatible with the GH2. Selection among all supported interface languages. Access to both PAL 25/50p and NTSC 30/60p frame rates. Extended low-light exposure settings up to ISO 12800. Removal of 30-minute recording restrictions in EU locales. Enlargement of MJPEG videos to 1080p FHD frame size. Pasadena Pulse Audio Patch V2 B2, thanks to Per Lichtman. The GH2's stock firmware limits its AVCHD encoder to a peak bitrate of 24Mbps in 24H and HBR modes, and to 17Mbps in FSH and SH modes. In addition, it uses long-GOP recording sequences of 12-30 frames that produce only about two keyframes (I-frames) per second. Flow Motion v2 boosts the AVCHD encoder's peak bitrate to 100Mbps in all video modes and uses a short 3-frame GOP in all 1080p video modes (and a 6-frame GOP in 720p modes), that produce 8-10 keyframes per second. These improvements enable Flow Motion v2 to capture highly detailed, fast moving images with far more fidelity than the stock firmware's restricted bandwidth can accommodate. At a deeper level of operation, the GH2's AVCHD encoder uses built-in Quantization Tables designed to compress the video data as efficiently and compactly as possible. When shooting highly detailed subjects, quantization often produces undesirable rectangular artifacts ("macroblocking") which are then filtered by built-in Deblocking Tables. Unfortunately, the tables used by the stock GH2 firmware sacrifice image quality in favor of compression efficiency, producing consumer-grade results. In a further reduction of image quality, highly compressed P and B-frames are encoded with coarser quantization tables than I-frames, degrading frame-to-frame consistency within each GOP. Flow Motion v2 replaces the GH2's Quantization and Deblocking Tables with custom matrices, hand-tuned for each video mode, that are crafted to minimize macroblocking and digitization artifacts. This enables the encoder to make full use of its available bitrate to encode genuine image details rather than wasting bits attempting to correct macroblock encoding flaws. In addition, Flow Motion v2 applies equal levels of quantization to all types of frames, producing P and B-frames that are visually indistinguishable from I-frames. P, A, or S exposure modes or when shooting in iA mode. I've tested and confirmed these features to work reliably at 60Mbps in 1080i FH and 720p H video modes. The 60Mbps FH and H video modes also support 4GB file-spanning on 30MB/sec Class 10 SD cards, and produce excellent motion picture quality that is just a notch more compressed than Flow Motion's 100Mbps FSH and SH video modes. This zipped INI file can be used to apply complete patch settings to firmware loaded into PTool 3.65d. To use, unzip the INI file into the same folder as the PTool application. Launch PTool and load the firmware v1.1 binary file for GH2. The settings contained in the Flow Motion v2.0 INI file will automatically be installed in the "F" button at the bottom of the PTool main window. Note that with the following PTool Settings File, you may at any time re-install the original Panasonic GH2 v1.1 firmware into the camera. You may also copy each patched or original firmware file to separate SD cards, and use them to quickly switch between patches as often as you like. Here is Sanity X, a new high bit rate version of Sanity. Sanity X tops out at 100M, but like earlier versions of Sanity, it only uses as much bit rate as necessary to reach it's quality level (which in this case is damn near ultimate). If there is not much movement or noise in the scene, the bit rate will drop down considerably, but the quality will not. And the best news of all, Sanity 5.1 is still available in this patch. What I've done is move the 24H setting of Sanity 5.1 into the 24L slot of Sanity X. So, you can have both at the touch of a menu setting. The other shooting modes, 1080i and 720p are unchanged from Sanity 5.1. Spanning works in Sanity X if you use a fast card. It has been successfully tested with 64GB Sandisk 95MB/s and 64GB Sandisk 80 MB/s cards. Ordinary class 10 will not work for spanning, although they will probably work fine for shooting. Spanning continues to work with class 10 cards in 1080i and 720p since they are unchanged. Spanning with class 10 cards also works in HBR mode if you use a third party manual lens. So, what exactly do you get with the higher bit rate? At first glance, it will be hard to see a difference between Sanity X and Sanity 5.1. That's how good 5.1 is. But if you look closely, there is just a tiny bit more finer detail in Sanity X. Also, if you lift the shadows in grading, you will see more detail in the range just above black. Is it worth it? Maybe, maybe not. That's for you to decide. But it's real easy to shoot comparisons - just flip between 24H and 24L. NOTE: Please download the file marked Sanity X Correct.zip. The first two files are faulty posts. ]]> GH2 Audio Hacks http://personal-view.com/talks/discussion/1152/gh2-audio-hacks Tue, 11 Oct 2011 21:32:40 -0600 thepalalias 1152@/talks/discussions @aenima for testing that! In the 30 minutes or so I spent searching for others' information on the audio hacks, I didn't find much so I'm starting a new thread. I'm still parsing through data from 12 hours of testing the hacks myself, but I wanted to invite everyone else to post their data too. I'll be posting ideal settings for using the hack to set levels appropriate for interviewing using the onboard mic or the 3 gain settings on a Rode Video Mic Pro shortly with plans to update with settings for another Sony lavalier mic within a week or so. I'm starting a new thread because this is something really special. Picture Quality - across-the-board, no-compromise, high quality images in all modes: 24P, HBR, 1080i and 720p. And all at very modest bitrates. There are improvements in all modes. 720p is especially notable because I have successfully got B-frames working in it, and it makes a huge difference. Stability - I hate write errors - hate em', hate em', hate em'. Sanity 4 is rock stable. I use Sandisk 30M Class 10 cards and have not had any write errors in any mode, including ETC. Of course, your milage may vary, but I hope not. Spanning - Sanity now spans in 24L, FH, SH & H mode. Two versions - Because of HBR mode, I was forced to make two versions of Sanity 4, one for NTSC and one for PAL. Samples - I've uploaded a zip file containing four raw MTS files, which show the same scene in 24P, HBR-30P, 1080i60 and 720p60. The shutter speed was set to 1/2000 sec, to really torture the codec. Even if you're a confirmed intra-junkie, you owe it to yourself to check this out. You just might be amazed. NOTE: When downloading from Sendspace, click the button that says "Click here to start download from sendspace". Do not click anything else. Here is an update for SANITY with vastly improved stability for the PAL version. This sucker is STABLE. In fact, so stable that I was able to raise the data rate in FSH/SH mode to 36M. So, there's better picture quality, too. I've also updated the NTSC version, although there was nothing wrong with version 4.0. I simply applied some of the things I learned from the PAL version, to make it even more stable. Call it preventative maintenence. Again, what SANITY is about is top picture quality is ALL shooting modes with reasonable data rates and 100% reliability. Here is a new version of Sanity with some major changes. First, it fixes a problem with a subtle pulsing in the shadows in HBR mode. But more importantly, in the process of fixing the pulsing, I discovered a way to create monster size I frames, while still keeping the bitrate low. In 24P, we're talking about I frames approaching the one million mark with certain subject material. And this applies to 24L, as well! For 24H I had to lower the bitrate from 66M to 38M, and yet the image quality is the same (and maybe better). I applied this technique to all modes; 24P, 1080i, 720P and HBR. Sanity 5 is unified for NTSC and PAL - there is only one version. Spanning works with 24L, FH, SH & H modes. When spanning, do not go above ISO 5000 and do not use ETC. Spanning works in HBR mode with third party manual lenses. Do not go above ISO 3200. Spanning does not work reliably in HBR mode when using Panasonic lenses. SANITY 5.1 fixes a problem of the image severly breaking up and prevents it from occuring. I strongly recommend SANITY 5 users install the update. SANITY 5.1 works reliably in all shooting modes - 24H, 24L, FSH, FH, SH, H, HBR, ETC in all modes, and all variable frame rates. Spanning works in 24L, FH, SH & H modes. When spanning, do not go above ISO 5000. Spanning works with ETC in 24L mode. Do not go above ISO 3200. Spanning does not work with ETC in any other mode. Spanning works in HBR mode with third party manual lenses. Do not go above ISO 3200. Spanning does not work reliably in HBR mode when using lenses with electrical contacts. Best size/quality render settings for web (youtube and vimeo): CBR, 12Mbps, keyframe distance 24. If there is lots of motion you can try VBR two pass with 12Mbps target and 16Mbps maximum. Let's start from a scratch as GF2 seems different from GF1. I just did 2x on some basic settings, AQ4, and default GOP 15. The video bitrate was set up 32Mbps, and the result was 33Mbps. Hopefully we can start polishing it. I looked and couldn't seem to find a nice, neat, and simple thread with only ini patch files people are using. I decided to start one. I strongly suggest we not make this a debate on which patch is better, just a place for people to post their patches with maybe a brief explanation of what is in the patch, which version of ptools you used, which SD card you are using, and maybe whether or not it spans to multiple clips without crashing or stopping. I'd like to see every post in this thread with a patch attached, no debates, no stand alone thank you's, no jibber jabber, just patches; you can do all those other things on another thread. I also strongly suggest everyone gives credit to the people who originally made the patch (if they know who) in their post. Posting the same ini files as others are welcome. This thread is not only a vault for GH2 patches, but also a good gauge to see what setting people are using a lot. I'd also like to thank @Vitaliy and everyone testing and making this all possible. The patch I am currently using is the @cbrandin 66Mbps AQ2 AVCHD Patch coupled with the @LPowell 100mbps Low Light MJPEG 1080p Patch. I used ptool v3.62d to make it and I am using the Sandisk Extreme 32GB 30MB/s class 10 SDHC card with no problems in AVCHD 24L or 24H as well as MJPEG mode. I haven't tested other modes yet. I have used PTool to “upgrade” my GH2 since the first version supporting GH2 came out. My favorite settings have been cbrandin 44 and 66, and they still works, but actually I have found that simple “settings for end users” in current PTool also works very well for settings that is not as extreme as many of the “expert” tester and developers settings like @cbrandin, @driftwood, @LPowell and others. I have found a gap between stock and extreme settings in the forums for us interested in an enhanced GF3. In current version of PTool 3.65d @vitaliy_kiselev in the background of the tool have built in the experience from the testing by the core team so when we end users are using “settings for end users” a lot happens in the background. I have tested a number of different settings only using “settings for end users” with bit rates spanning between 24 and 66 mbits and stock GOP’s of 12/15 as well as 6 and 3. When doing this I have adopted cbrandin’s method of using a multiple of stock bitrates. With this Topic I encourage people like me to discuss and disclose basic settings in between stock and “extreme”. I start to include three different settings, one stock GOP, one GOP6 and one GOP3. to extract 24p from the wrapped 60i use this free software: https://handbrake.fr/ , it can configure and save parameters and can do batch processing. Because my English is poor, there may be many unclear things, but I do my best in some questions to answer enduringly. For example, if some setting tries to use low qp with the frame size limited like Intra, many level lines of the high qp macroblocks will also appear in each frame pictures. Although it is unclear for appearance in looking with eyes, it means that the codec is not committing this correctly. I am making the settings which can use the lowest possible qp appropriately, avoiding this isuue by using the biggest possible I-frames. On the high detailed scene, if the minimum qp is too low, the range of qp will spread and, as a result, many of these level lines of the high qp macroblocks will appear. Therefore, in my settings, on the high detailed scene, it has adjusted so that the minimum qp may become high appropriately. On the other hand, it has adjusted so that the lowest possible qp can be positively used under the lowlight. I think that 3GOP can realize this all-round performance with the motion. Therefore, when using my settings as only for lowlight, you may feel thing insufficient only a few, although sufficient dark place performance is still given. However, also in a bright scene, the codec hardly wavers with my settings. This is the point that especially I am scrupulous. My top priority is "recording does not stop by any means in any situations." *The issue which the high bitrate hacked GH2 cannot often span more over 4GB is not contained in this. In order to adjust so that recording may not stop in a high stress scene, you have to test supposing the stress beyond it. I have spent many hours also on the torture test for it. *The purpose tested with this screen is the check of durability or reliability to the last. About image quality, it cannot check at all by this test. I understand that this test exceeds the stress assumed practically. However, in the settings which cannot clear this test, the Risk of Freezing Camera momentarily practically is large. Moreover, although the issue of "freezing the moment a focus suits" is recognized in many other GH2 settings, about it, it cannot necessarily solve only by this test. I have also solved this issue now by the test which repeats focusing for several minutes. I aim at the setting not freezing. If my settings may become unstable with SanDisk 95MB/s SDXC, please give me feedback. *The spanning is possible perfectly in 24p with SanDisk 95MB/s SDXC. These features are common in almost all my settings. Best noise reduction matrix. All tweaks from previous apefos patches. Solves the Diagonal Rain Pulsing Pattern. stable and high versions are GOP3 for 24p, HBR PAL, HBR NTSC and 720p50. GOP4 for 720p60. 720p is I and P frames. Other modes are I and B frames. intra version is GOP1 for 24p and HBR PAL (only I frames - intra), GOP3 for HBR NTSC and 720p50. GOP4 for 720p60. All GOP3 recording modes are I and P frames. stable: auto electronic features works. In Pal all recording modes are stable. In NTSC the H and FH can be more stable than SH and FSH, but the SH and FSH are better quality. Tip: try using only one or two auto electronic features in SH and FSH in NTSC. Auto electronic features are: Auto Exposure, Auto Focus, OIS image stabilization, iDynamic, iResolution, Noise Reduction. Example: using OIS and idynamic and disable other features in SH NTSC is good idea. If using all features enabled at same time in 720p or 1080i, use the H and FH recording modes. 1080p24 24H and 24L both works ok. This is the best thing I loaded to my GH2. Stable, reliable and excelent image quality in all modes, works for cards with 24/30/36/45MBps constant write speed or above depending on the version loaded. Best option is to use 45MBps cards and above, which I used for the tests. setg is the recomended version, safe and great quality. seth and seti are for lower speed cards, but does not have same quality of setg. setj has more aggressive settings for even better quality. The base is FlowMotion 2.02 from LPowell because he did a great careful job to tweak the quantization, matrices and tables and get perfect image quality in all modes with quiet camera or camera movements. The modifications are in datarate and gop to make it completely stable and reliable without stop recording in all modes. For best image quality use the 24H, SH, FSH and HBR. The 24L, H, FH does not have the same quality and are for save memory space and for you to try in lower speed cards if needed. The bitrate is very well distributed among the I, B and P frames giving a fluid random texture and noise in all modes and isos, The gops and datarate are well balanced to each other with the benefits from the quantization, matrices and tables from FM202. In the setg 24H, SH, FSH and HBR, the texture is beautiful, noise is homogene, no macroblocking, no mosquito noise, no texture mud. Great use of the 8 bit codec in dark areas, excelent high iso performance which cleans ok with neatvideo and with a small amount of film grain you cannot tell it was shoot in high iso. Optimal results for blu-ray output and big screen projection. 720p 60p upscaled to 1080p works great for slow motion, just use your skill to denoise, sharp and upscale it. Apply film grain to your taste. If you like the feel of the original noise, just keep it, or just remove a little bit of chroma noise keeping the luma noise, and no need film grain. No stop recording in all tests with setg. tested with green grass under sun and shadow and also tested in all modes with the four Stray's colour death charts. Tests done with 6400 iso which is very difficult to the hack to handle and it worked ok. Tests also done in the end of card space (3 minutes left) and no stop recording also. Sandisk 32GB SDHC 45MBps was used. The audio has Pasadena settings, from FM202. Spanning was not tested with this patch. Also it needs transcoding with 5DtoRGB free software before editing to avoid the diagonal pattern (rain). It is clean after converted to Apple ProRes. I Converted to the LT version with great results and smaller fle sizes. If somebody wants to test spanning I recomend to use the lower bitrate modes and tweak the TOP and BOTTOM datarate limits in the advanced settings for testers in PTool. I Own a Fz1000 for a while now.. it gets lots of noise above iso 800.. it over exposes the video and its hard to get maximum flatness in 4K mode.. slow motion mode is a kill.. it actually kills the video..slow motion in fz1000 is not usable.. any idea how to get low noise 4k video with a very maximized dynamic range?? This is the final patch from Apefos. Read the developing history in post below. It has all achievements from previous Apefos patches: WorkHorse, Boson, GSpot, DCT, Apefos Settings, The Patch, Denoise (see Top Settings section of P-V to read about these other patches with discussions). Solves the Diagonal Rain Pulsing Pattern problem. Matrix desing with fallback finetuned for isos 6400 and below, in custom design for each recording mode. Improved for best image quality considering the noise, details and texture minimizing artifacts, banding, moiré, aliasing, flickering. Also improved for denoise in Luma and Chroma channels for delivery a clean image, but preserving the texture. Deblocking matrix improved for removing macroblocking. For flickering free images use isos from 160 to 2000. Some isos can be better than others, some isos can increase noise or flickering, some reports says that isos 320 and 2500 are no good even with other patches, so do your tests about isos behavior in your GH2. Careful tweak in all settings of the ini file in PTool tester section for best stability and image quality with extensive tests since 2013 year resulted on this patch. These settings working together makes the datarate enough for great quality. Best gop configuration for the available datarate: 24p = gop 3, hbr = gop 3, 720p50 = gop 3, 720p 60 = gop 4 The frame rate perceiving is similar in all areas of the image, similar to intraframe gop1 patches due to the finetunings (read post below). In Pal all recording modes are stable. In NTSC the H and FH can be more stable than SH and FSH, but the SH and FSH are better quality. Tip: try using only one or two auto electronic features in SH and FSH in NTSC. Auto electronic features are: Auto Exposure, Auto Focus, OIS image stabilization, iDynamic, iResolution, Noise Reduction. Example: using OIS and idynamic and disable other features in SH NTSC is good idea. If using all features enabled at same time in 720p or 1080i, use the H and FH recording modes. 1080p24 24H and 24L both works ok. The camera never freezes, no battery pull needed. 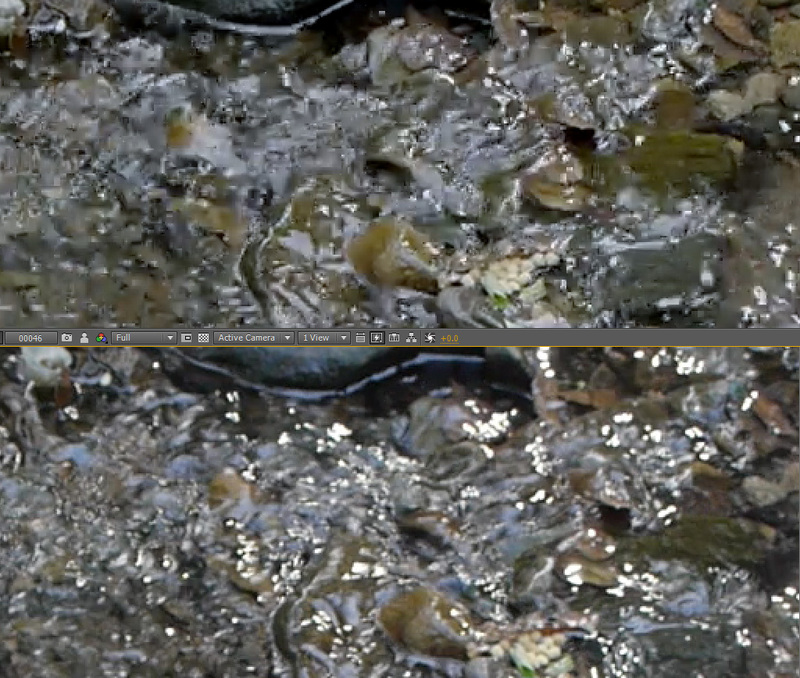 Works very good for neatvideo denoise using temporal noise reduction "1" and spatial luma noise reduction "30". In neatvideo, set the noise area in a more fine noise on the screen instead of on a gross noise area when denoising high isos. Chroma reduction in "100" with a +50 in first sliders also is good for high isos. Stress tests was done in the 45MBps Sandisk card, but it can work in slower cards also (30MBps). Added a second zip file with The End High Datarate version, for the datarate freaks. For use with manual lenses, avoid native lenses for more stability. Auto electronic features does not work in 720p, 1080i and HBR, avoid them. H and FH can be more stable than SH and FSH. In 24p the native lenses and the features can work, try both 24H and 24L. Datarates are: 24H = 104Mbps, 24L = 96Mbps, SH = 96Mbps, H = 88Mbps. Same gop as the stable version. If it cannot handle the recording it will stop recording and go back to stand by mode, the camera will not freeze, no need battery pull. All the settings in the patch was finetuned to work good with the standard default stable datarate version and the image is ok. I do not know if it would worth changing firmware just to increase datarate. Maybe a datarate increase can change the balance of I/P/B frames size and improve just the I frames quality and makes the texture pulsing, more noticeable in slowmotion. Do your tests. Or just use the default version which is ok, improved for good slowmotion. (for more details read next posts below). In my tests I saw no significant benefits using the high datarate version for 720p60 NTSC in high iso 2000, it just improves I frames quality a little and introduces more pulsing due to generate higher difference from I and P quality, when doing slow motion this creates pulsing, the datarate increase is not enough to change the textures of the P frames in 720p. About 24p, it is already good datarate in the default version using the 24H record mode so there is no need to use the high version for 24p. Also, PAL lands are less frames in HBR and 720p so the camera can record more data per frame making the default version very good for PAL. Even the HBR mode which is a challenge for patches is looking pretty good in the default version. People likes comparisons, so the two versions are here for tests. My final option is to keep "The End" in camera and no more firmware change. I do not see significant reasons to use the high datarate version, maybe for HBR in NTSC mostly (read posts below). Whats it all about? Achieving the best looking overall pictures around - throughtout the popular GOPs. The great thing about Cluster X developments is you can mix and match some of the settings to combine into your favourite setting (e.g. GOP1 for 24p and 25p/FSH, GOP 6 For 1080i60/30p and 12/15 for 720p etc...). Slipstream settings do this for you (mixed and matched and with spanning capabilities where we can plus 80% modes on H & iA mode support). This has been a tough (and still ongoing) challenge, each setting (and ptools patch change) takes an age to check & measure. Its exhausting work - even with 4 cameras on the go. The measuring to check Quantisation, frame sizes and stability adapting one change at a time is pretty debilitating on mental energy. I hope people appreciate waiting for each setting to appear. All the new Cluster X series settings for each GOP attached below have been tested on the notorious 14-140 Pany sharp lens. Give me feedback. Its as simple as A, B, C, D, E, F ! Each .ini setting in ptools for Cluster X Series will equate to setA ('DREWnet' 12/15 GOP), setB ('Nebula' 6 GOP), setC ('Spizz' 3 GOP), setD ('Moon' 1 GOP/3 GOP), setE (Slipstream 1) & setF (Slipstream 2) setG (Slipstream 3) and finally setH (Redshift). Any updates will stay on these sets. Maybe increasing the DC number and keeping same or similar numbers in the matrix can deliver a denoised image more video look, which would be useful to save denoise time in post production and to be good for web upload (web upload likes clean images due to low datarate). any number repeat can be tested: 12, 16, 18, 20, 24, 28, 32 or 36 in all positions for Luma ( I am thinking about to try multiples of 4 or 6 which are good dc numbers for the matrix I found in "The Patch" topic. I think deblocking tables can be low, because quantization in main matrix is already high in first digits (near dc number). I am thinking to try 1, 2, 3, 4 or 6 in all positions for intra and inter. I think there is no need for fallback, also due to high quantization near dc number. Or fallback can be implemented same way the patch did, to allow iso increase using the fallback for it. I am starting this topic to discuss ways to achieve constant quality encoding with variable bit rates. This idea can be applied to GOPs of different lengths. First Goal: to find the best balance in datarate and IPP frames size inside the GOP3 for 720p50 PAL and 720p60 NTSC to make it inside the datarate and frames configuration which holds good details and good noise, grain and textures at same time. Second Goal: to find the best balance in Scalling Tables with Fallback Tables with good noise and textures in low light and good details in low iso good light also. Under development - no new versions in this first post. I started to play around with ptools 3.65d in an attempt to develop a stable/reliable and good quality settings for GH2. In these RAW times I thought more than 40 or 48Mbps bitrate would be good for grading and highlight/shadows improvement in post. But I would like to keep things in a practical way for daily use, good recording time and no firmware changing. In a previous topic of mine I found GOP3 solved the diagonal pattern aka rain problem when playing files on computer, so I started the tests with GOP3 for all recording options. First test was with 128Mbps vs 64Mbps in 1080p 24p. I started with these values due to be similar to Cineform "High"datarate and also due to the recording time. With the camera on tripod indoors, at 3200 iso, in a detailed scene, both recordings showed a file with something about 56Mbps, so the AVCHD codec was not needing more than this. So I decided to keep these settings 24H = 128Mbps and 24L = 64Mbps, both GOP 3. Then I started to strees the codec: I went outdoors and did some recordings with lots of camera movements and also indoors in detailed cenarios in high iso with lots of movement. Also shoots with camera steady to compare. I found the bitrate increased, and the maximum I found in the files was something about 114Mbps, so even in more complex situations with movement and detailed images the AVCHD codec did not need more than 114Mbps to do it with GOP3 even if it had 128Mbps to use. It was just not using all available bitrate, maybe due to 1080p 24p GOP3 does not need more than this. GOP3 is very good quality because there is always a I frame besides each B frame, and B frames size increases when there is camera movement. In my study reading the topics about Ptools patches here in P-V, I read something that said: if you have enough bitrate you do not need to worry about quantization. maybe because there will be enough bitrate for everything. so I started to think: if the codec was not using all the 128Mbps even in complex situations, and GOP3 being good quality, why should I use GOP 1 and why worry about quantization? So I did nothing about this in Ptools. I decided to keep myself in GOP 3 and 128Mbps maximum. Also, I found the difference recording 24L = 64Mbps and 24H = 128Mbps both GOP3 was almost unoticeable. I just saw very little difference, just found by pixel peeper people in a pursuing behavior, when I paused the playback in a high camera movement shooting foliage. Without pausing it I could not tell the difference. And when the camera was steady, there was no difference to perceive because the codec was not stressed. My conclusion is: for a daily use, 64Mbps GOP3 will be the best option because it gives one hour of footage in 32GB SDHC cards and it is great quality. With the camera on tripod, indoors at 3200 iso, I could see some difference in small letters on a bootle in a image comparison between 64Mbps and 40Mbps video. I can read that small words better with 64MBps. I could not see difference in this same scene (camera on tripod, high iso, detailed scenario) when comparing 128Mbps to 64Mbps. The 128Mbps GOP3 gives half hour in 32GB cards and can be used in scenes with lots of details and movement together, the only situation it is really needed. To compare things, the Cineform codec in HIGH setting uses a maximum of something between 120Mbps and 180Mbps when transcoding mts files to avi intra. Remember it is 10 bit 422, so it needs 1,67x more bitrate than 8 bit 420. It is something like 160Mbps in Cineform is similar to 96Mbps in AVCHD. And when you render in VirtualDub using the same Cineform HIGH settings it keeps around 70Mbps, so the 128/64Mbps GOP3 in GH2 hack is pretty equivalent to Cineform quality. I used 128Mbps for SH and 64Mbps for H, and started to play with GOP. I only could get some amount of footage with the default GOP 30. the others always stop recording, and when they records some time, if you move the camera fast in foliage it stops. So I perceived the GOP 30 was the most stable for 720p 60p with 128/64Mbps, but there was recording stop after some small time or when camera moves fast. (The B or P frames size increases when there is camera movement and quality is good). I enableb high iso up to 12800 and that's all. I got no diagonal pattern (rain) yet, but needs to shoot more tests in different situations to be completely sure. These are my 6 Patches with the best settings I found for GH2. I did not test spanning because I do not need it. sete = conservative settings with just datarate and gop changing, high datarate for 1080p 24p and mid datarate for 720p 60p, gop3 for 1080p 24p and default Panasonic gops for other modes, avoids the diagonal pattern (rain) noise in all modes. I am trying to improve the quality of 720p 60p in GH2. Only GOP which works good for 720p 60p are GOP 30 and GOP 3, all other GOP gives diagonal pattern (rain) in computer monitor. But the GOP 3 in 720p always stops recording and it seems the card is not the problem, I am using Sandisk 45mbps and other people says the Sandisk 95mbps also stops recording in 720p hacks... The GOP 6, 12 and 15 works for some shoots, but they are unstable (sometimes stops recording) and gives diagonal pattern (rain) in computer monitor. GOP 3 stops recording all the time, no matter the bitrate (I tested GOP 3 from 40 to 200mbps). So GOP 30 is the only option. Only thing I found to make the bitrate encoding keep high is the GOP 3, but camera stops recording in all 720p shoots, the GOP 3 just works for 1080p. Is there a way to find out how many mbps my camera gh2 is recording at?